This hike was rather reminiscent of last year’s climb to Mt. Okuratakamaru with blue skies intermixed with shrouded mist hampering the view. While the first day’s weather was ordinary to say the least, day two provided a reprieve with a well-defined silhouette of Mount Fuji materialising at dawn. For a description of getting to the trailhead check last year’s trail notes from Mt. Okuratakamaru. The hike follows the same route up to Yunosawatoge 湯ノ沢峠 which takes around 2.5 hours from the Yamatoten Mokusan Onsen bus stop. At Kaiyamato Station there was a hefty throng of hikers waiting for the first morning bus for a short 10 minute commute to the trailhead. 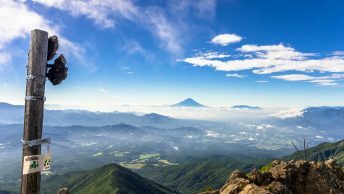 As this hike is generally carried out in a reverse direction, more often than not, you will be hiking along the road to Yunosawatoge solo as most passengers get off at Kamihikawa-toge. Below the refuge hut at Yunosawatoge there is a reliable watering hole to fill up your water bottles for wild camping at the gushingly named Mt. Ushiokuno gangaharasuri. From the refuge hut it’s a fairly sustained climb up to Shirayanomaru 白谷丸 (1,920 m) where the trail levels out and in good weather Mount Fuji provides a striking backdrop. Time permitting there is a short trail veering off to the right towards a rocky outcrop. From here it should take another 20 minutes to reach Kurotake 黒岳 (1,987 m). A little before you reach the summit of Kurotake you pass through an undulating stretch with a few trees displaying early autumn foliage. While the summit doesn’t offer much of a view it makes a pleasant enough spot to take a breather. The next target is Kawakomozawa 川胡桃沢ノ頭 (1,940 m) where a rather forlorn looking sign is revealed in a grassy area. From here the trail slides down to a saddle covered with sasa (bamboo grass). According to the map, there is a “nearby” waterhole about 10 minutes away off to the left. Scouring Yamareco didn’t glean much information and a previous sign post flagging its whereabouts had been torn down – a hum from the watercourse could be heard however. The final push on the opposing ridge passes by some large coniferous trees. On summit of Mt. Ushiokuno gangaharasuri 牛奥ノ雁ヶ腹摺山 (1,990 m) there is a choice spot to set up a shelter aligning you with Mount Fuji. The mist and light rain had cleared by sunrise permitting some lazy photos of Mount Fuji outside the tent door. Apart from a few Japanese sika deer making the occasional cry it was a blissful sleep. The tent was as expected completely drenched though the temperature remained comfortable in the low teens during the night. From the campsite the trail continues along the main ridgeline. The first point of call is Mt. Koganezawa 小金沢山 (2,014 m) an easy going 45 minute stroll. Take a rest here as from the summit across to Ishimarutoge 石丸峠 the trail demands your full concentration. Keep a careful look out for the pink tape makers and an even more watchful eye on your footwork as you clamber through dense forest and exposed rock gardens. From Ishimarutoge where the trail opens out in the bamboo grass it remains quite flat apart from a short drop down to a forestry road. At the forestry road turn right and left again after passing by the landslide damaged embankment. Keep alert for the sign post on your left to Kamihikawa-toge 上日川峠 as it’s easy to miss. It takes around 30 minutes to get back to the car park for the 40 minute bus ride to Kaiyamato Station.